Even though most of us favour a Republic, we do love ourselves a Royal Wedding! 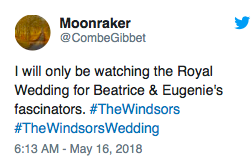 There was no escaping royal wedding fever over the weekend. For all of us commoners who didn’t score an invite to the exclusive party at Windsor Castle, you were probably sipping on some less than Royal-worthy champagne, in an outfit that didn’t come with a designer label. Nevertheless, all eyes were on Meghan Markle as she stepped out of the car at St. George’s Chapel glowing in her regal Givenchy wedding dress. Using Crimson Hexagon we were able to look into what everyone was saying about the Royal affair on social and there was a lot of buzz. Over 3 million people around the world flocked to social media to spread the love- Twitter was the dominant platform, followed by Instagram. Everyone had a lot of love to give and quite simply loved tuning in to watch the show from all around the world. Americans loved the show, with over 40% of the total Royal Wedding conversations stemming from the United States. Us, Melbournians were also amongst the top Royal fans, ranking as the 6th city worldwide with the most number of posts (source: Crimson Hexagon). 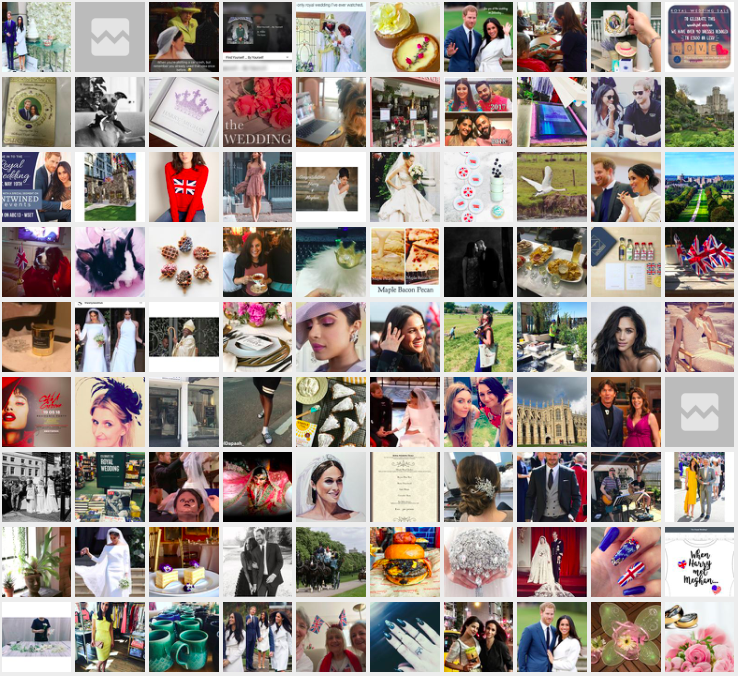 Using Crimson Hexagon we were able to identify some of the hottest topics on social circulating around the wedding. The invitation list was a key topic of conversation, with everyone eager to see who had scored an invite. Trump seems to appear in just about every conversation, however this time everyone was happy to hear that he did not get a royal invite. In the lead-up to the wedding, conversation centred on who would walk Meghan Markle down the aisle, as it became apparent that her father would not make it to the wedding. Overwhelmingly, people thought that Meghan’s mother Doria Ragland should be the one to accompany her daughter, but in the end Prince Charles stepped up to the role. A lot of people were unhappy about the decision, but it seems tradition holds. 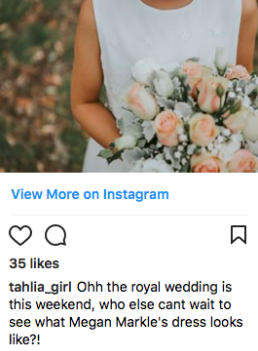 Fake it until you make it, that was everyone’s response to the Royal Wedding. 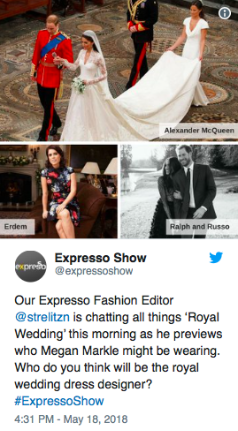 Looking at the image palette from the Royal Wedding conversation, we can see everyone was getting into the spirit and hosting their own Royal Wedding parties, posting their own Royal feasts as well as fascinators, outfits and make up all. The Union Jack made a strong appearance within the image palette, from flying the flag, knitted on jumpers and even painted on nails. Meghan took out the populous vote on Instagram, appearing in 23% of all posts. From the star studded guest list, who took out the best dressed and what everyone was saying according to social. Who could forget the headpieces Princess Eugenie and Princess Beatrice were sporting at the last royal wedding back in 2011! Well on social media, no one. Talk of Princess Beatrice and Eugine’s hat game continued this time around, with everyone anticipating what the girls would be wearing. In the last royal wedding, Pippa Middleton stole the show with her perfect peach in her figure hugging bridesmaid dress. 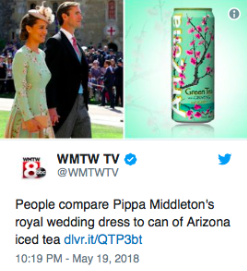 This year however, conversations were a little different comparing the belle’s dress to a refreshing can of Arizona iced tea. Amal Clooney was the Queen on the wedding red carpet and came out as the best dressed guest. 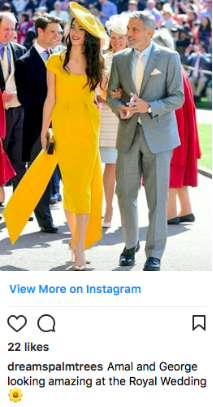 Most people would resemble a wayward squirt of mustard, but Amal looked radiant in her completely yellow Stella McCartney dress. So now that both royal bachelors are hitched, it’s time to hang up the memorabilia and wait another 25 years until little Prince George invites us to the next royal bash.